← Who do WE ride for? Kicking off the Second Annual ride on a gorgeous misty morning! 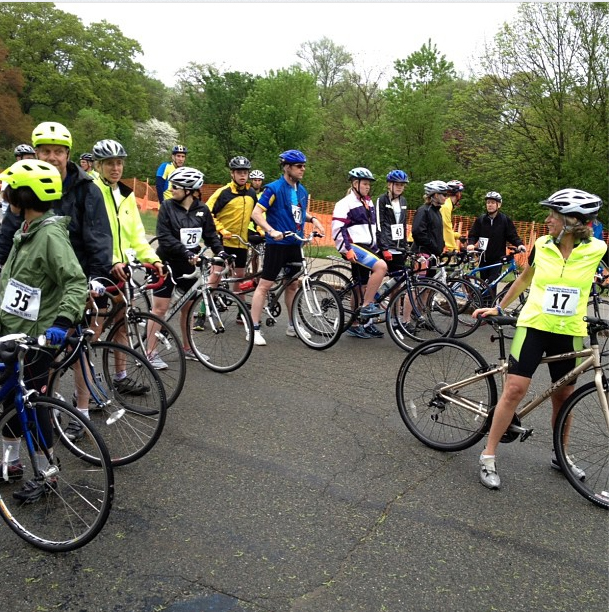 Our Second Annual Christina Clarke Genco Mother’s Day Memorial Ride last week was a huge hit! Starting the day off with a little rain didn’t stop our 100+ participants from setting out on our 68, 34, 17, and 3.4 mile routes! 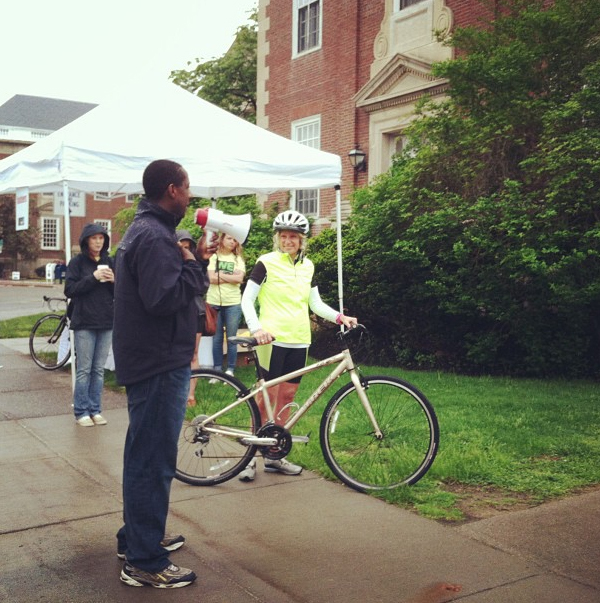 Mayor of Newton Setti Warren, sending off the 68 mile route through the rain, promised that he’d ride the 68 mile route in 2014. The Boston University Pep Band huddled under a tent and played off the 34 and 17 mile route starts, with everyone in bright and beaming spirits. Heaps of volunteers showed up to man rest stops, manage and move materials under tents, direct traffic, and cheer on the finishers. By early afternoon, the clouds parted, the sun broke through, and everyone was rewarded with a gorgeous spring day—just in time for an amazing reggae music dance party by Toussaint the Liberator. Lots of food, fun, sponsor visits, and celebrating the riders’ returns took place while everyone switched from hot to iced coffee. With the help of all of our supporters, we were able to yet again pull off an incredible day with incredible people for an incredibly important cause: affordable housing. President of the Foundation Caroline Genco being interviewed by NewTV! 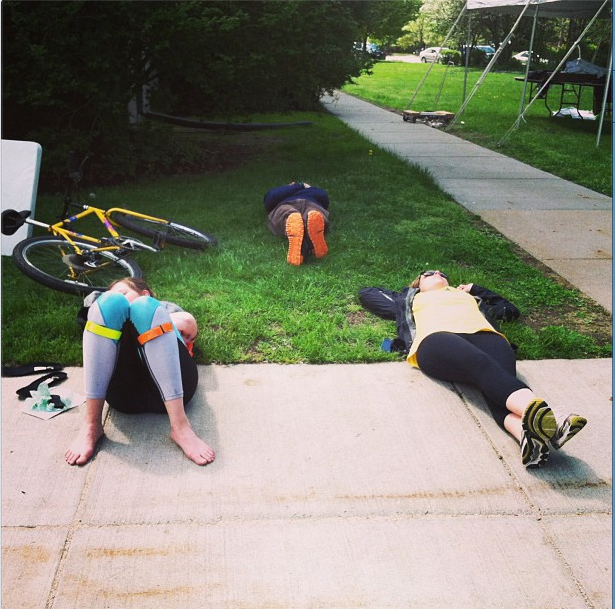 Taking a much-deserved nap post-ride in the sun! We also would love to thank Whole Foods, the Cheesecake Factory, T Anthony’s, and Jamba Juice. It was truly incredible to see the kind of support that came out for the ride, and for the night before: Our first ever Spring Benefit at the UForge Gallery! Displays of Christina’s artwork (including two crowd favorites: her heavily-stickered bicycle from her first cross-country bicycle trip and her self-portrait bust sporting slick sunglasses) were displayed as participants snacked on beer, wine, and heavy hors d’oeuvres and mingled around. It was a fantastic alternative to those supporters who already had standing Mother’s Day plans, weren’t cyclists, or just couldn’t make it to the ride the next day. Look out for a nice photo gallery on our Facebook page for the event! With these two events together, the weekend turned out to be a spectacular success for the second year in a row. Did you participate this year? Please share your thoughts, experiences, and great moments from the weekend in the comments below!